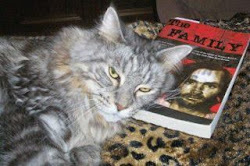 My Life After Charles Manson...by Patricia Krenwinkel. I've said it before,and I'll say it again. I feel sorry for Pat. She was ugly and unloved and she unfortunately met a creepy guy that told her anything she wanted to hear. And she fell for it. He knew what she needed and he used it against her. I'm not saying she should be released. She made her own decisions. She decided to try and please him. That was her decision. But why don't the killers just say why they did it? Why this mumbo jumbo about these killings? It's time to just tell the truth! I think there's going to be a hearing tomorrow to determine who gets Manson's body. Katie, other than the fact that she murdered and wss more then devoted to Manson I don't think she has the answer. Text, maybe. Right Bobby! Manson & Tex are probably the only ones who know what really happened. And Manson's not talking anymore.